Kristina Elyse Butke: Witness to "The Great Work"
This is a post about the joy of seeing someone else's work come to fruition. Take it as a signal boost, a shameless exhibition of pride, and a call for writers to actively participate in creative projects outside of your own. Either way, it's a story of my experience working with author Jennifer Loring, and I want to share it with you. 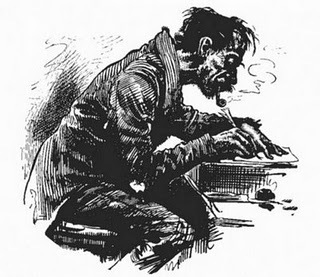 They say writing is a solitary pursuit--there's a reason why the image of the crazed author typing alone is so pervasive--but it shouldn't be this way. You are denying yourself an incredible opportunity for growth if you don't trade your work with another writer to allow for an exchange of ideas and feedback; you're missing out on sharing in the joy and hardships that come from the act of bringing a work of art to life. There is a special kind of magic in watching something grow. When it comes to the writing process, I can't call it anything else but alchemy: the creation of the Great Work. The magnum opus only comes about through a series of repetitive actions that encompasses the breaking down, separation, fusion, and transformation of a piece; in the alchemical sense, it is the transmutation of base materials into the ultimate form (gold). The metaphor was a bit heavy-handed, but I had to use it! It's the best way to describe what it feels like to start a story, draft several versions of it, cut out large parts of it, reforge the leftover pieces into a new story, then parse it down again, repeating the process of cutting, combining, stripping, and cleaning, until the story reaches its final conclusion: publication. I'm lucky and proud and delighted I was able to witness Those of My Kind in its crucible stages. I witnessed a lot of power in Jenn's writing--how horrific images can be tempered with beautiful language, for example--but I also learned from Jenn that sometimes you have to embrace destruction and transformation, because it's necessary for the final work to reach its full potential. Jenn and I were critique partners at Seton Hill University for the Writing Popular Fiction program. I started at SHU a full semester before Jenn, and we were randomly assigned to work together because my two previous critique partners graduated. I remember meeting Jenn in the dining hall and after we gushed about fairy tales and darkness (arguably my reasons for writing fantasy), I felt like I won the lottery in terms of critique partners. We shared a lot of the same interests and had similar goals when it came to what we actually wanted to write, but at the same time, we had (and have) very different writing styles--which meant we could still learn quite a bit from each other. I was new to prose after writing for the stage for such a long time, so I made a lot of amateur mistakes. Jenn was very graceful about letting me know what's what, and I learned so many new things (like, third-person subjective POV actually being a thing, and that crepuscular is an amazing word). We stuck together as critique partners during our entire time at SHU, and got to see each other's theses from their starting to penultimate forms. It was right towards the end of our Term Writing Projects (where we submitted writing to each other and our mentors for critiques) that Jenn came up with a brilliant new character (Blessing Adeyayo) that completely transformed what she had before. At such a late stage in the game, Jenn scrapped much of what she had to accommodate this new invention. There it is in action--creation, destruction, creation (alchemy in process!). I was so burnt out on school at the time, that if I ran into the same thing--a new, brilliant character working its way in--I would've just tried to shoot the new idea down and turn in whatever crap I had just to get by. Jenn by no means wrote crap. She could've kept whatever she had and it would've been great. But Jenn opted to serve the story. The arrival of Blessing meant a lot of rewriting, and I was able to catch a glimpse of this new work-in-progress, but so much of the additional changes remained a mystery to me because we graduated; and while we were done with school, we weren't done writing, so Those of My Kind continued to grow and evolve on its own. Not gonna lie--this had me tearing up! Screenshot from Kindle for iPhone. It's the best feeling in the world to see it reach its ultimate form: it is a published work, available as a trade paperback and ebook, from an awesome press making waves of its own. I pre-ordered the ebook and downloaded it as soon as it was available; I'm also getting the paperback because I plan on forcing Jenn to autograph it. I'm in the midst of reading it now, and it's a feeling of nostalgia and discovery mixed together--I recognize shades of the work in progress, now fully polished, but there is still so much that I'm seeing for the first time. I was really lucky to work with Jenn. Her own writing, and the feedback she gave me on mine, has helped me grow immeasurably. She was gracious enough to include me in her Acknowledgements, which was the sweetest thing ever. If you're reading this, Jenn, your time is coming! You will have your name on my pages, too. You should buy Those of My Kind. Not because Jenn and I are friends and helped each other out in grad school; not because her Proust interview was pretty freaking awesome; not because I wrote this gushy love-love post. You should buy it because it's a really good book from a really good author.